We're all familiar with instant messaging and using it to chat to people in realtime. Sometimes, though, we might want an app which allows us to send messages anonymously to friends, or to chat anonymously with strangers in close proximity. An example of such an app is Truth, which lets you talk with people on your contact list without disclosing your identity. Let's kick off by signing up for a free Pusher account (or logging in if you already have one). 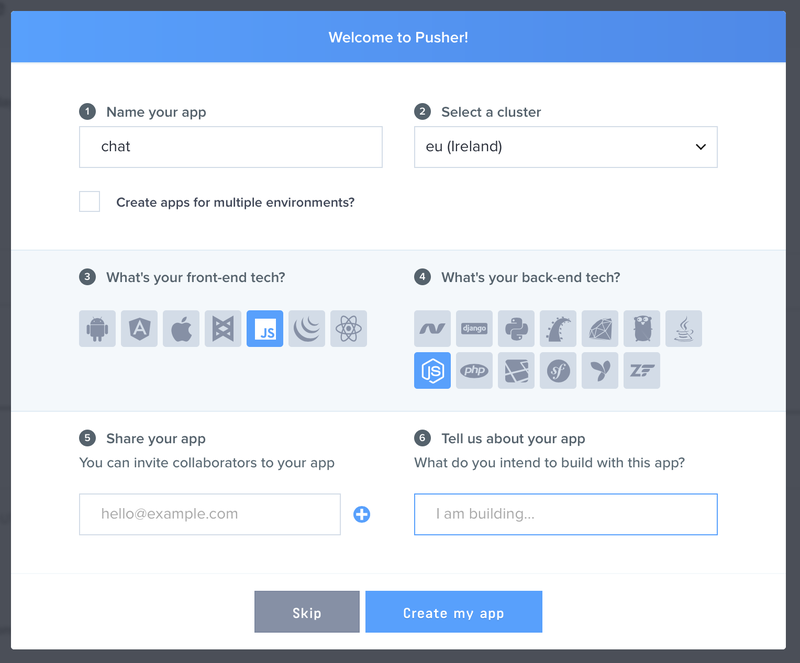 Once you're logged in, create a new Pusher app from the dashboard and make a note of your App ID, Key and Secret, which are unique to an app. To create a new Pusher app, click the Your apps side menu, then click the Create a new app button below the drawer. This brings up the setup wizard. Enter a name for the application. In this case I’ll call it “chat”. Select the option “Create app for multiple environments” if you want to have different instances for development, staging and production. Select Vanilla JS as the frontend and Node.js as the backend. Complete the process by clicking Create App button to set up your app instance. We need a backend which will serve our static files and also accept messages from a client and then broadcast to other connected clients through Pusher. Our backend will be written in Node.js, so we need to set it up. We need a package.json file, and I'll add it by running the command below. I'll use the defaults provided by hitting enter for every prompt. With the code above, we have defined an end-point /message which will be used by the client to send in the message it wants to send to another client through Pusher. The other routes are used to serve the static files which we will add later. Replace the placeholder strings App ID, Secret and Key with the values from your Pusher dashboard. Add another file called index.html with the markup below. I'm using a template from bootsnipp which has been slightly modified to display just the name and message. With the code in this file, we get the message to send from the page, and then call the server with the message. After that, we connect to Pusher by creating a new Pusher object with the App Secret and the Cluster that you set earlier. We subscribe to a channel and an event named message-added. The channel is a public channel so it can be named any way you like. I've chosen to prefix mine with public- but that's just my own convention as there are no rules for a public channel. The difference between a public channel (which does not require client to be authenticated), and the other two, are that they're prefixed with private- and presence-. We bind to the click event of the chat button on the page, then we retrieve the message from the textbox on the page, and then send it to the server with the username. With all we have setup, we can run start the app by running npm start. Here's a glimpse of how it works on my computer. This is a app to show how you can use Pusher to send messages in realtime. We built a public anonymous chat app that allows your website visitors to send anonymous messages to each other in realtime.